Please see link in title to for viewing info to documentary. In my life time I have had the privilege to be in the practice of graphic design for over 25 years and one of the most influential designer’s that I admired is Massimo Vignelli. I have fortunately been able to follow in his design path, I had projects working with institutions such as Seattle University and the University of Washington. I have designed maps and information systems for Community Transit, in Snohomish county of Washington state. My media publication design involved 5 newsletters and an annual report for Microsoft, many annual reports for a number of corporate clients as well as Corporate branding and brochures for Microsoft and AT&T. I feel a kindred spirit to Massimo’s work, although we never met I feel I know him intimately through my own path. 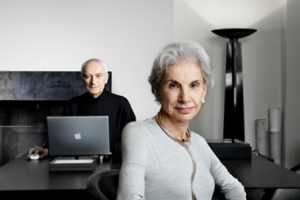 Italian-born Massimo and Lella Vignelli are among the world’s most influential designers. Throughout their long career, their motto has been, ‘If you can’t find it, design it’ The work covers such a broad spectrum that one could say the Vignellis are known by everybody, even those who don’t know their names. From graphics to interiors to products and corporate identities, the film brings us into the work and everyday moments of the Vignellis’ world, capturing their intelligence and creativity, as well as their humanity, warmth, and humor.